Both have small clasps of gold, of simple but beautiful workmanship, fastening with a slender ridge and groove, which do their work as perfectly as when the necklaces were worn by the Egyptian princess 2000 years B.C. 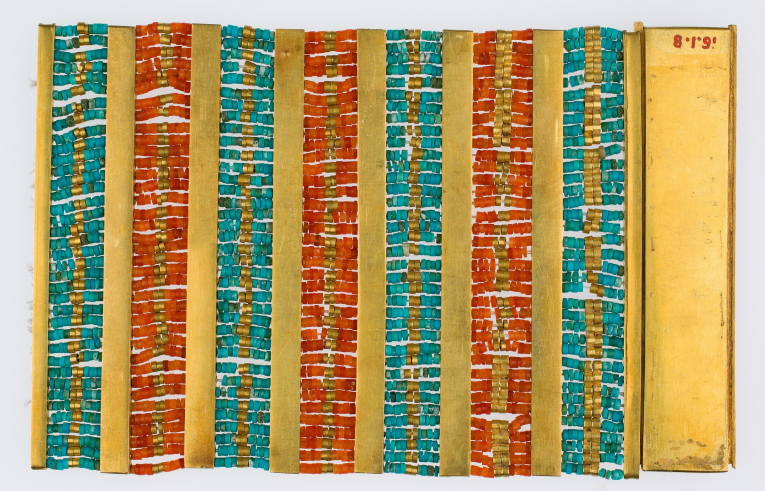 A girdle is of gold, carnelian, and green feldspar beads of rhombic shape, with massive ornaments in the shape of cowrie shells made of rich, deep gold set at intervals between the double rows of beads. A collar is made of double lion heads, one of these halved to form the slide. There are armlets, wonderful in color scheme, made of the semi-precious stones and gold, beautifully worked; slender bracelets of the beads, with little lions in gold recumbent; and little gold bead amulets have the charm in the pendant. The most remarkable piece is a necklace of pear-shaped beads, with an elaborate pectoral or breast ornament. 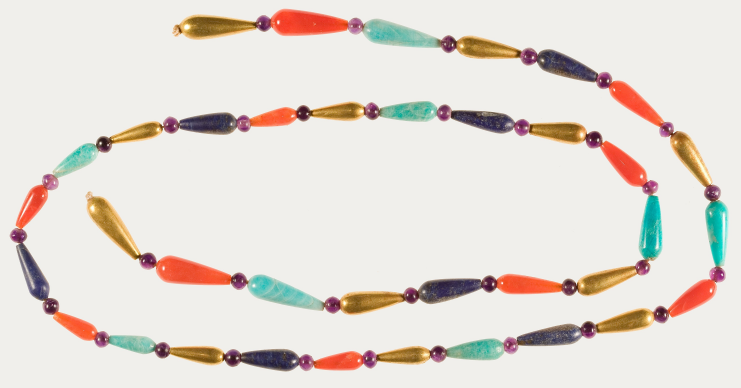 In this the beads are of carnelian, lapis lazuli, and the green feldspar, while the pectoral is of finely wrought gold, the colors on the upper side being produced, as there was no enameling in those days, by an inlay of the semi-precious stones. There is in this the cartouche of Senusret II, flanked by two falcons. As the pectoral is shown in the museum, it is raised above a small mirror, which permits the beautiful workmanship in the gold of the underside to be seen. There are other articles, including the ornaments of jewel caskets which contained the jewels, some of these of ivory, which it is hoped may be restored. The use of cosmetics was common in the days of the Egyptian princess to whom belonged this royal collection of jewels, and there was found in the same niche her cosmetic vases of polished obsidian, black, mounted in gold, and with remnants of the color which carmined her cheeks and lips still remaining, while in a tiny pot, made of the same material, is the black with which she darkened and added lustre to her eyes. There are eight other small alabaster vases and four alabaster canopic jars, with the covers in the form of portrait heads, each bearing the name of Sithathoriunut and her title of "Royal Daughter." Parts of the massive sarcophagus in the burial chamber of the princess showed that grave robbers of ancient days had probably opened it at one end to admit the body of one of their party, who had removed the mummy, no traces of which remained with the exception of two bands of the funerary ornaments, which were of much less value than the actual jewels worn during lifetime and which are now in the possession of the museum. This collection will remain on exhibition in the Room of Recent Accessions for the next month. It was excavated under the direction of Professor W.M. Flinders Petrie . 1. Image from the Metropolitan Museum of Art used under the institution's Open Access for Scholarly Content intiative. More on the OASC here. 2. Note that this article pre-dates the discovery of the tomb of King Tutankhamun by three years; Howard Carter and the Earl of Carnarvon did not discover that tomb until 1922. 3. The reign of Senusret II (also rendered as Senwosret II) is dated today from 1897-1878 BC. Scholars have posited that he could be the pharoah referenced in the biblical stories of Joseph. Sithathoriunut (also spelled Sithathoryunet) may be the fifth known child of Senusret II. 4. 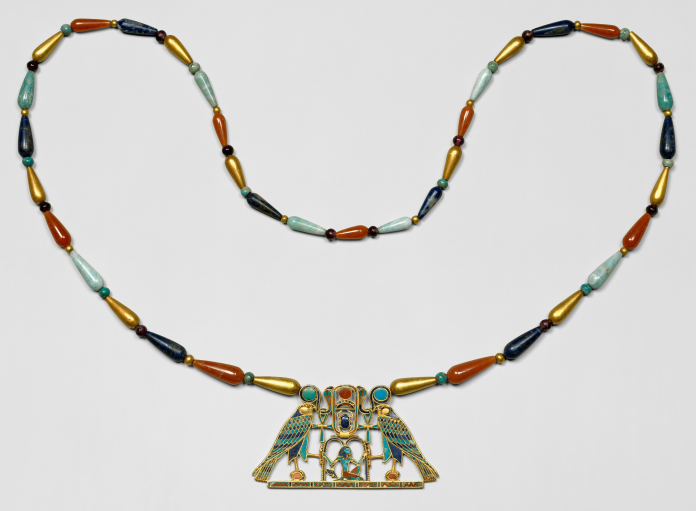 Petrie, an English Egyptologist, excavated the tomb with Guy Brunton (Petrie's student, who would later become assistant director of the Cairo Museum) in 1914; he sold his share of the jewels to the Metropolitan Museum of Art in 1916, and they are still in the permanent collection today.